"God, if you would just take this coughing and stuffy nose and sickness off of Bug and give it to me, I would gladly take it...I mean, I know you are so able to do this God, You are all power and all love and all mercy..."
"Wait, I know He can, but do I doubt He will? Am I sitting here asking God to do something and not really believing He will? What's wrong with me..."
"I do believe that God is in control. I believe He is faithful, he is good, he is love and that he can heal. So, right now I ask You, God, to please allow my son to get a good night's sleep, remove this cough from him and help him feel better. I know that you can and I believe that you will." I probably don't even have to tell you that just after this I realized that several minutes had passed since Bug had coughed. And I held him just a few more minutes to make sure he was really asleep before I put him back down, not because I doubted that it happened, but because I was cherishing the snuggle time and the complete awesomeness of God. And he didn't cough again, not once. I laid him back in his crib and didn't hear another peep from him for the next almost 3 hours before I got up for work. Obviously, right here is where I share that one of the purposes of this post is to give God glory for healing my son last night. Praise God! The other purpose in this post is to share how amazing God is, when He reveals himself through his word. And how awesome He is when, He chooses to give us more faith, more knowledge, more understanding through his word... even at unexpected times, like 3 in the morning. When I laid back down in my bed, my mind immediately went to some scripture that my discipleship class had studied a few weeks back about Jairus's daughter and the bleeding woman. This occurrence is recorded in Mark 5:21-43 and Luke 8:40-56. (We were doing a book study so this point that we discussed was initially made to us by Jared Wilson in his book "The Wonder Working God:Seeing the Glory of Jesus In His Miracles.") Jairus was a prominent man, he came to Jesus knowing that he was able to save his daughter and believing that he would save his daughter. The bleeding woman, however, was poor (she had given all of her money to physicians for healing) and she was probably of low standing in society. She believed that Jesus had the power to heal her, but she doubted he would take the time to do so, i.e. she touched his garment herself to be healed. I remember studying this and thinking how sad that this woman thought so little of herself and knew so little about Jesus that she didn't realize that He is love and mercy, power and might. That He would have healed her had she just asked. I doubt for a second that he didn't know who it was who touched him or the very instant that she pushed through the crowd and was about to touch him just as he knew instantly when she did. I am a strong believer in the sovereignty of God. I believe that He is above all things and before all things and in complete control. 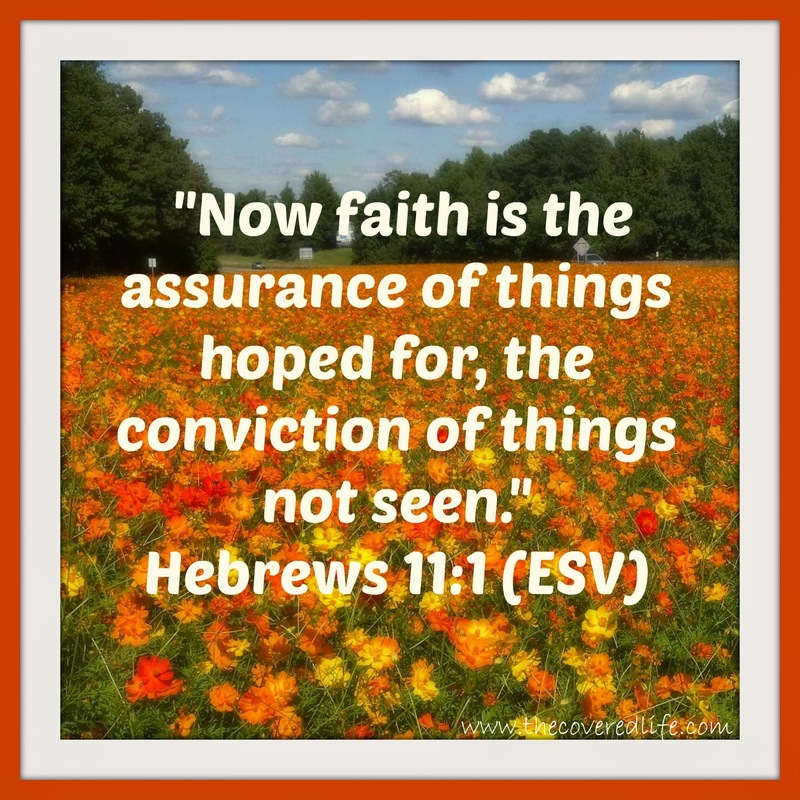 What I had to be reminded of last night that he revealed in little aha moments during my conversation with him in front of him was Hebrews 11:1, "Now faith is the assurance of things hoped for, the conviction of things not seen." 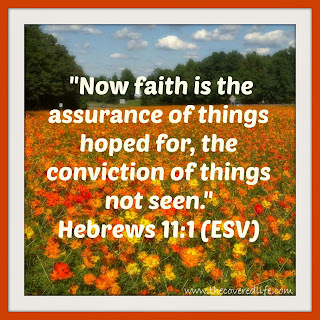 Faith isn't just believing God can, it's believing He WILL. I still don't believe that God should be viewed as a genie or wish granter-- He is SO MUCH MORE than that. But I do pray that my faith is stronger today than it was yesterday and I pray that this post will perhaps encourage you as well.